This past year was the warmest year in terms of rising temperatures in Switzerland according to Meteo Swiss. The weather agency reported that temperatures in 2016 were 0.6 to 0.7 degrees warmer than usual across Switzerland. Switzerland’s federal weather office also mentioned that 2016 has already earned a spot on the top ten mildest years on record. According to the federal weather office, 2016 began with a mild winter, which culminated in snow and cold temperatures arriving by mid January. The average temperatures have been significantly warmer than usual according to Meteo Swiss. The temperatures from December 2015 to February 2016 were 2.5 degrees warmer than normal according to Meteo Swiss, the mildest since 1864. This isn’t the first time for Switzerland to experience warm temperatures; it is notable that the warmest winter ever was in 2006-2007. During that time the city of Bern recorded 16.4 degrees Celsius on one day at the end of February the fifth highest for the month since 1864. Remarkably Meteo Swiss released an official statement on its website stating that since the mid 1970s there has been a clear rise in average monthly temperatures in winter. When Switzerland experiences warmer winter temperatures this affects its tourism industry significantly, many tourist from around the world rely on Switzerland’s pristine alpine slopes for a skiing adventure like no other. 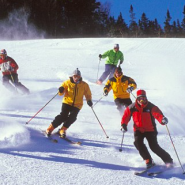 When temperatures rise many ski resorts are unable to operate due to lack of snow and this affects the tourism industry significantly. Globally 2015-2016 was experiencing higher temperatures than normal according to the World Meteorological Organization, due to a combination of strong El Nino and human-induced global warming according to a report released by the World Meteorological Organization. Even though temperatures dropped sharply in October and early November lack of snow has made it significantly difficult for ski resorts to reopen, with hardly any fresh snow falling. World meteorologists say that Switzerland’s rising temperatures in 2016 were in line with a global trend, which set 2016 to be the hottest year on record across the globe. With 2017 just beginning no one knows what the weather would be like, but fresh white snow falling on the alpine mountains might be welcome news for many skiers.